Your yard will be the envy of all the neighbours when you have a RYOBI 160cc petrol self-propelled lawn mower. The self-propulsion is perfect for those who have sloped properties or a large lawn. Combine this with the auto choke and you'll find this mower to be the most user-friendly petrol mower you have ever owned! This lawn mower is built to be tough, durable and efficient. With a 2 year replacement warranty you will get that extra peace of mind. Whether you have a larger area to get through, or a small courtyard, this machine will get the job done every time. That's not all - the mulching plug will cut your clippings down to size to be used as mulch on your lawn bed. This means you have a convenient, natural fertiliser applied each time you mow. 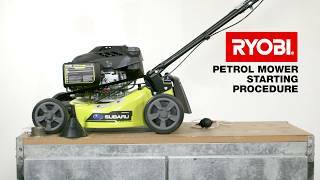 Find our 160cc petrol self-propelled lawn mower, along with more RYOBI tools and hardware, at your local Bunnings Warehouse.